One of the effects of the long drought our area has experienced, is that the garden suffered. For about a year we were not allowed to water our gardens at all, so the gardens had to survive on the little rain that fell during that time. Now that it has started raining again, we’re surprised at how well our garden is recovering. So well in fact that we can’t keep up with the plant growth. I am starting to feel like that princess in the fairytale, whose castle is completely overgrown with plants. 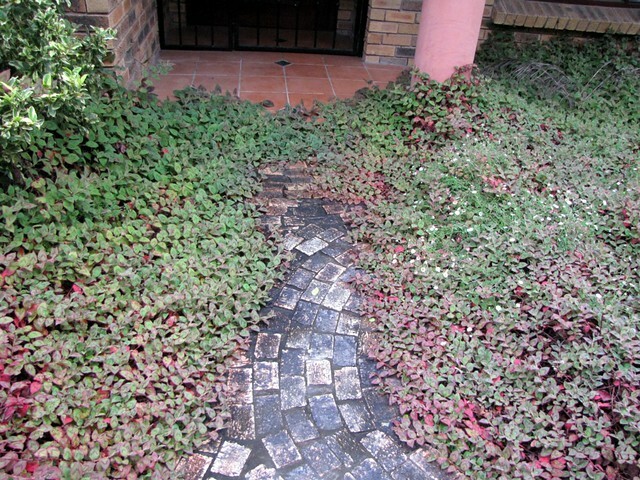 Ground covers in the flower beds which had died back to expose bare soil, have grown back and then some. When the lawn was not mowed for two weeks, the grass grew so quickly that it started to resemble a field. Even the Grass Funnel Web spiders started to set up home on the lawn. I was hanging up washing on the outside clothes line the other day, and saw that little moss or lichen plants were beginning to grow on the actual clothes line itself. Besides this and the fact that all the flowering plants are in bloom, the biggest indicator that our garden is recovering is that three plants, which are not designed to endure drought conditions, have made a comeback. Partly due to the fact that whoever designed the garden, had the foresight to plant them in sheltered and shady areas next to the house or garden walls. 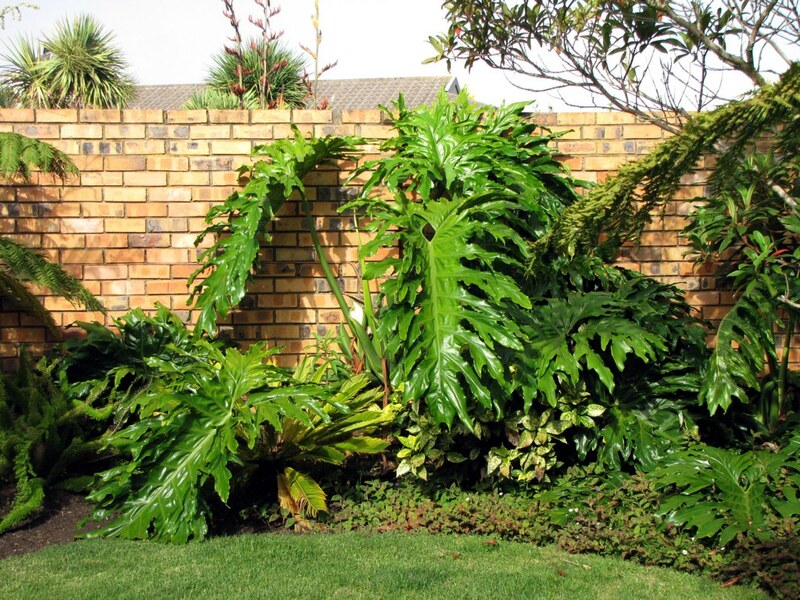 We have got a number of Delicious Monster (Monstera deliciosa), plants in our garden, which have grown quite big over the years. This is a creeping vine which is native to the tropical rain forests of Central America. It belongs to the Araceae (Arum) family, which is the same plant family that the Arum or Calla Lily (my favourite flower) belongs to. Although these plants did okay during the drought (with only the loss of a couple of leaves), they did not flower. Until now. And the Delicious Monsters are also growing lots of leaves. Seeing this many developing leaves at once is very unusual. Then there is this funny plant. We have one growing next to a Delicious Monster in a wetter area, against the side of the house where the bathrooms are situated i.e. they benefit from some of the water run off from the geyser. The plant dies back completely in winter, and then grows leaves again in the Spring. I am calling it the “Mystery” plant, but if anybody knows what it is, please let me know! It too has got a flower for the first time ever. The one group of plants that did not fare well through the drought, were the tree ferns. Although they were also planted in cooler, sheltered areas in the garden, they lost a lot of fronds during the drought. You can still see the dead fronds in the photograph below. 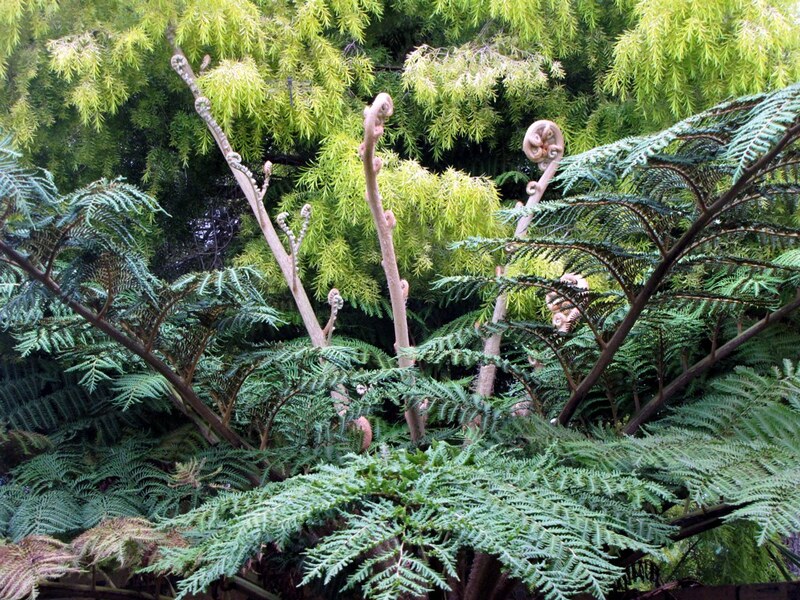 After the good rains we have had, the tree ferns are also producing lots of new fronds. Wow! Your garden is so nice and green after the rains. Can’t believe its the same garden I saw in July. Yes, the Southern Cape is really green now. Very pretty here! Your post left me with a very happy feeling. I love all that green and growth, so well captured in your photos; a true sign of new life! How are things going re: the drought in the Eastern Cape? Are you having any good rains there? We’ve had a couple of showers here in December, but not nearly enough to fill up the dams and lift water restrictions. We have also had tons of rain – its awesome. I have sent your mystery plant to someone who may know what it is. Sorry, your comment got held back for some reason . . . The plant has since been identified as an ornamental Rhubarb (Gunnera species – of which I’m told there are a LOT!). It’s really heartwarming to see Nature bounce back. I spent some years living out in the dry Australian bush, and went through several years of drought. When it was broken, the stony plains sprouted beautiful delicate looking wildflowers, and burrowing frogs surfaced within 24 hours. An unforgettable experience. “Heartwarming” is exactly the right word! Amazing isn’t it how the plants and creatures respond to the rain? Our toads/frogs have also re-surfaced after a long absence. Hope you figure out what the Mystery Plant is! Enjoy your new surroundings – I look forward to it in a few months! We’re sweltering here in the mid-summer heat, so I’d trade with you in a heartbeat. THEY ARE ALIVE…ALIVE!!!!! RUN…RUN I TELL YOU!! Yeah, I’m starting to get nervous! Well, I can’t take credit for the name, but it made for a good title. those are sweet. makes me extremely jealous that i cant even keep a snake plant alive in my condo! You’re not the only one . . . if those plants were in my care, they would also be dead by now! Your yard and garden is beautiful! I only wish I could have such a nice garden. I live in the hot and dry portion of Texas, and it’s just not possible. I’m envious! Although we live in an area with forests and lots of greenery, I actually love deserts. We often travel up to the Kalahari desert for vacations. [If you look on my menu there’s a link to the “Kalahari Series” – which is our photos and stories from our trips.] I would probably feel different if I lived there all the time though. Having a little bit of rain over there must be great. It shows me that I whine about having too much rain here in LA, but there are places out there that thirst for a drop of the golden liquid we call water. The transformation must have been amazing. Your garden must have transformed into paradise after rain. The area I live in is mostly fairly wet, but there’s been this severe drought in recent years. Our usual weather is cool, wet winters and hot, dry summers. Before the drought, we also complained when it rained too much! Beautiful. Whats amazing is how durable nature is under the most extraordinary circumstances and tests. It never ceases to astound me. Here in the Midwest things grow like crazy so yard work tends to get a little bit on the excessive side. But the “greenery” makes it all worth it. Yeah, we’re not complaining either! I thought we would lose a lot more plants in the drought. Our garden looked really sad before the rains started. Thanks, and thanks for the laugh! I’m actually more afraid of the Monster plants. One near our bathroom, managed to snap the water pipe with its roots. plant as it reminds me of a cobra getting ready to strike. Enjoy. You’re right, it does look like a cobra’s hood. Does the Delicious Monster plant only bloom or is there an edible portion to it? Yes, apparently it forms a fruit which can be eaten. According to Wikipedia, it’s not safe to eat it until it’s ripe – and that takes up to a year! I studied horticulture years ago. I can tell you that plants that die back and return, like bulbs, can also be from corms, rhizomes or tubers. I tell you this because I think there are relatively few plants of these types, and you may have success in finding your plant if you look it up according to how it grows. Take a look in the ground. Potatoes are tubers, irises and the ginger root we eat are from rhizomes (long), and corms are roundish things, flatter than a bulb, and smallish. I think if you discover it IS one of these types of underground stem, you can look up a list of the plants with that part, and then search images. Wow, thanks for the tips. I’ll definitely be using them to narrow things down. Thanks, and thank you to for visiting my blog! I’m jealous of all your green. It’s grey here right now. I’m feeling a little grey myself lately. So what’s up with the monsters? Why are they called delicious? Do you eat them? Can you eat them? Yes, apparently you can eat the fruit – but only after a year of ripening! Thanks for reading my blog, and the comment! Oh my, I love these pics so much, they are FABULOUS. I don’t know what I would I if I lived in the midst of such natural splendor lol. I am a plant addict and landscaper. The Tree Fern is one my favs plants and I intend to find one somewhere :). Thanks for sharing. Tree ferns are such interesting plants, aren’t they? Our garden has some unusual (well, for gardens in our area) plants including cycads and different types of palms. Somebody definitely put some thought into planning the garden. We were lucky enough to move into the house when the garden was already established. Nice come back after the drought. Hopefully, we humans can be as resilient and as beautiful when we bounce back from haerdship. Good point – we can learn a lot from nature. Your photos make me in a hurry for spring–and we still have 3 more months of cold, winter weather here! I love working outside in my yard. I have dreams of making it a place of beauty and relaxation. Looks like yours is already there. So glad the rain came and brought back your flowering and leafy plants for you to enjoy again. Hope you find out what kind of plant that is, but I’m sure you’ll enjoy it’s beauty whether you know it’s name or not. Our garden is nice, but at little overgrown at this stage (not that I’m complaining!). Having a variety of plants also means that we have a lot of birds visiting us. You’re right about enjoying beautiful plants even if you don’t know what they are. What beautiful plants! I’m so glad that they are getting enough rain now to make a comeback. Calla lilies are my favourite as well, so I think the delicious monster is wonderful! The Monster flower does look like this huge Calla lily, doesn’t it? Think you may be right. My brother said it looks like “Wild Rhubarb”. I will have to look at some photos online, and see how the flowers compare. Lisa!! Your blog made the WordPress landing page! I was so excited to see it there. You deserve the attention for all the work you have been doing on this blog! Yay!! Thanks, it was quite a shock! 🙂 I appreciate all the encouragement you’ve given me over the past months. That is what I was thinking too. Looks like rhubarb. Thanks, and thank you also for visiting my site! THAT is one of the most beautiful things I’ve seen in a long, long time. You are well blessed, would that it would do that here! You’d not appreciate it as much had it not been drought prior though. We never appreciate beauty like this until we’ve been without it. You are so right there. When we first moved to this area, and we had a lot of rain each year, we never gave the beautiful greenery much thought. Beautiful gardens. so. . . delicious monster plant. . .is the fruit edible? And your mystery plant looks like some sort of rhubarb relation. glad that the rains have restored things for you. The fruit of the Monster plant is edible – eventually! It has to ripen for a year. I have no idea if it takes good or not. Andrea (see her comment further up) also thought some kind of rhubarb plant. It does look like that, but has spines/spikes on the stems and leaves. Thanks for the tip about the “devil’s club” – I will definitely check that out. I live in Brisbane, Australia, and we have a huge Monstera in our courtyard. It has fruit on it just now. Like you we had been in drought for ages, but now it won’t stop raining. I think the fruit might rot before it ripens. Great blog and post! I think I might sign up. Have you also been affected by the flooding in Queensland? Parts of South Africa are actually flooding as well now. Hopefully we don’t get THAT much rain here. We are not affected in the city, but what is happening inland is just awful. I also have a house in Italy in a small village. They have had snow this year – fairly unsual. I will be there soon – leaving hot and wet for cold and wet. Having a house in a small Italian village sounds lovely! 🙂 How much time do you spend there? I thought it as a metaphor of life … as a story of hope … that life prevails. You’re right about that. It certainly makes me feel happy and hopeful! Mother Nature really is miraculous! Congrats on the gardens renewal & Freshly Pressed! Thanks for sharing the beauty! Thanks for the kind comments and for visiting my blog! Congrats on making the WP homepage! Hi, Lisa! Thank you for chosing “I like” in my blog (my first experience!). I visited your blog and it’s very interesting. It’s special for me because in 1990 I visited South Afrika, participing in a International Seminar for Youth People, organized by Rand Afrikaan University, from Johannesburg. We met Mr.De Klerk, your President at that moment, we visited many cities including Cape Town, Pretoria and also the amazing Kruger National Park. I went for my own to Durban and Swaziland, another great experience. I’m from Argentina, but living in Honduras, Central America. Be in touch. Hi Pablo! I was attracted to your blog by those beautiful photos of the Orioles. Later in the day, I was actually able to translate your blog post into English using Google Translate (I don’t speak Spanish). I think it translated it well – I could understand your writing well. I have subscribed to your blog and will try and comment in future. It’s interesting that you’ve visited South Africa before. Thanks for visiting my blog, and commenting! Very interesting. Do you eat the fruit of the Monster plant? Yes, apparently you can eat the fruit once it’s ripe. We experiencing more than a little rain……… my garden has become a swamp…. and my i think even the goats and sheep are fed up. Haha. Loved your pictures. Congrats on being Freshly Pressed!!! Thanks for the kind comments! I am really hoping that we have just enough rain each month, and that it doesn’t flood here too. How glorious! Every year after the winter when in spring the plants push through the ground (in New Jersey, the U.S.), I am in awe of nature’s regenerative powers. Your garden is a testament to that, as well as to a real gardener who knew what they were doing when they placed the plants. Makes a lot of difference. Poor ferns don’t like it hot and dry. They want wet and some shade, for sure. 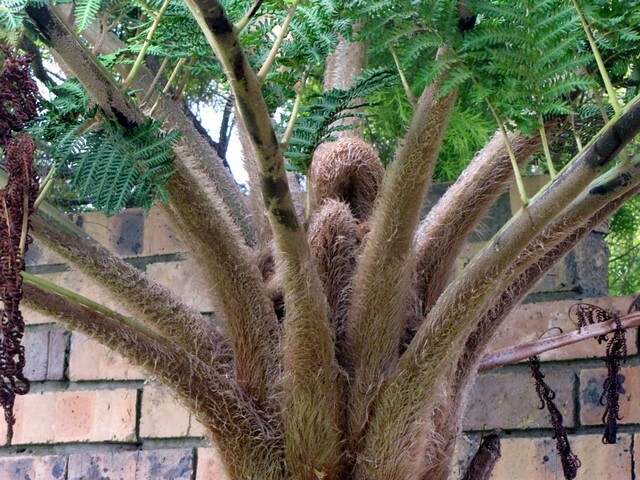 But your tree fern looks great now. 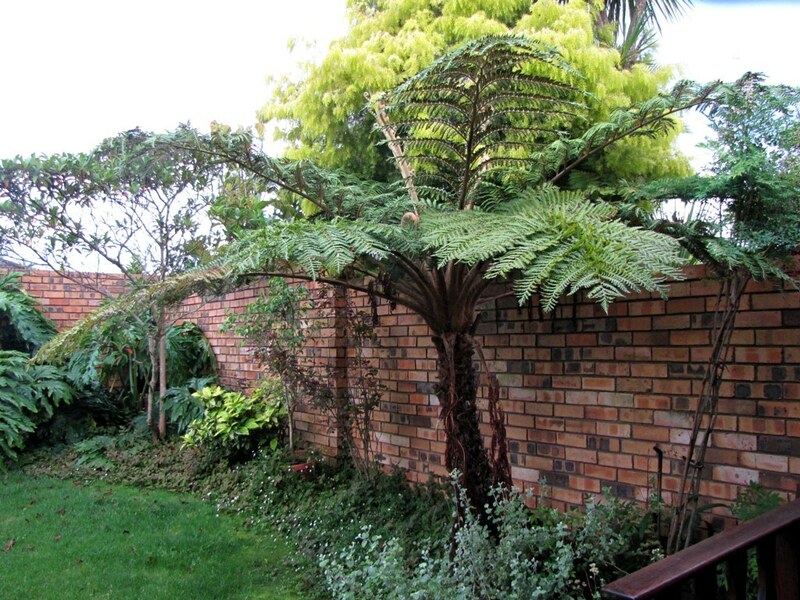 I wish we could grow tree ferns here! Too cold over the winter. What a magnificent looking plant. The leaves on your huge mystery plant look like Philodendron leaves to me. 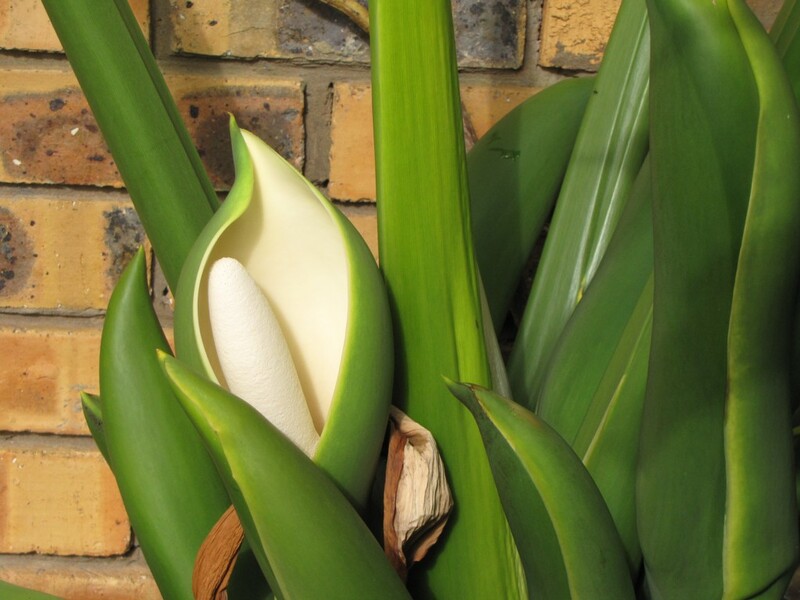 I thought I was probably wrong (because of the lily-like flower) but looked up “araceae” on the web and Wikipedia has pics of the various components of that family, of which Philodendron is one! So it is in that family, for sure. Just happy to spot a plant I recognize, even on another continent! Thanks for sharing your inspirational photos. Lovely and soothing. It’s so good to see gardens of every description — very inspiring. While it’s winter where I am, I am reminded it’s spring somewhere else on the planet! Thanks for your kind comments. What kind of flowering plants do you grow in New Jersey? It’s rarely that cold here, that plants die back completely. I’m trying to imagine what that must be like. I was wondering about the Araceae too. Thanks for the tip about Philodendron. Does the US plants have spines/spikes on the stems and leaves? Hasn’t there been some movie where they used a Monster plant gone out of control? These pics are making me so so so so so jealous!!!!! NOOOOOO!!!! Need. Garden. Now. The mystery plant is a Gunnera of some sort, the to most commonly grown in Sweden where I’m writing from is the tender Gunnera manicata and the very seldomly grown Gunnera tinctoria which only grows here in the very south of sweden or inside unheated greenhouses. They come from south america where I’ve heard that the tinctoria-one is used in the same way as we use rhubarbs in spring. Cool plants, the can grow enormous even here. Nice to see all that greenery up here theres about 50cm of snow an has been tha past 1,5 month. Its going to be a long winter. 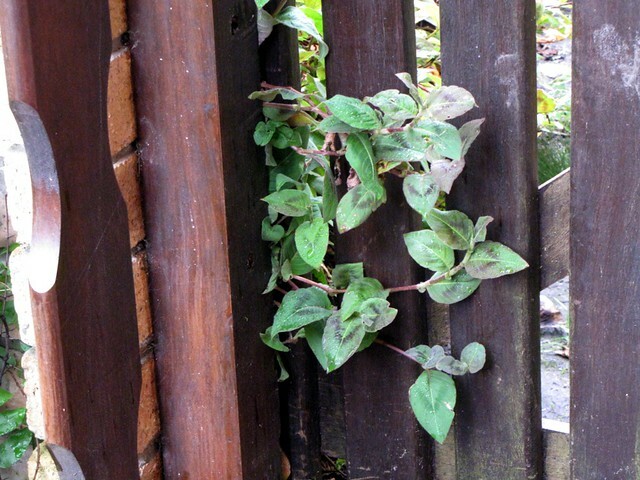 Thank you – I’m very excited that our mystery plant has been identified! 🙂 I see that on Wikipedia they say that Gunnera manicata is purely ornamental. My family is from Northern Europe, so I struggle with the South African heat. Would not mind having some of that snow right now. Thank you for visiting my blog and for all the interesting information! 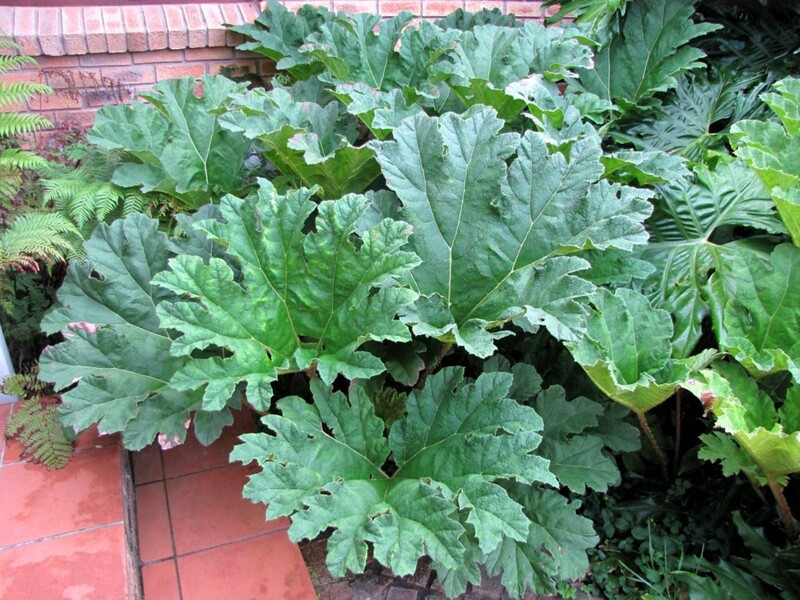 The mystery plant looks a little like rhubarb…. but i’m sure there are lots that look like that i guess if the stems turn red its a sure sign. So lovely to read simply about plants and watching them grow, refreshing indeed. I think we share a few things in common, i am currently living in Africa, Sierra Leone, and trying to grow a little garden, mostly veggies, perhaps a very bad idea considering we have just come out of the wet season. Anders Kjellsson in the comment just above yours identified it as an ornamental rhubarb (Gunnera species) from South America. I had a look at photographs online and think he’s right. I always find it interesting to read people’s thoughts on living in foreign countries. Will definitely be checking out your blog archives. The title: It’s my version of a “Harry Potter”-inspired title! Love your garden! Rain reminds me of my province in the Philippines and seeing plants grow and flower according to season. I miss being in the province and being closer to the elements. I’ve been to South Africa several years ago and am absolutely in love with it. Was in Cape Town for two weeks, went on a daytrip to Stellenbosch and spent several days in Joburg and Praetoria. Wish to go back someday. Hope you enjoy your stay there. I live in New York now and I try to enjoy little details of the city and the aspects of living here that I won’t be able to enjoy anywhere else. I have just seen photographs and documentaries of the Philippines. Looks like a beautiful and very green place. The gardens there must be stunning. Living in New York must be so different, but very exciting. I am glad to hear that you enjoyed your visit to South Africa. just stopping by, but this is beautiful. Thank you, and thanks for visiting my blog! This really is such a nice blog! Thanks for your comment and for coming by! I’ve just found your blog and really love it, you show me a way of life so different from the present UK winter. But for both of us, new life in the garden is so thrilling whether from winter cold or drought. Seeing your plants and landscapes in the middle of our snow is a life saver! Yes, seeing plants growing and thriving is thrilling. Thanks for your kind comments and for visiting my blog! I love this garden of yours, it’s so green! I’d love to have my own garden…the most I’ve been able to do (living in a big city) is have potted plants. It’s nice in summertime to see the colorful flowers on the windowsills…but it’s not the same. Sigh. Thanks for the lively pictures! Having greenery around you is very calming, isn’t it? At least New York (that’s where you’re living, isn’t it?) does have some amazing parks you can visit when you need a boost. When I was living in Redondo Beach, Cali there were several in the garden and I was fascinated by the banana-like fruiting body. I used to touch it while going to and from errands and noticed that it was significantly warmer to the touch than other plants. I notified my granddaughter and we watched it and took temperatures until we decide to dissect it to see what was going on. We were able to see multiple pistles. Have you gotten positive Identification? That is interesting! Amazing what one discovers when one takes the time to explore nature. Our senses of touch and smell become just as important as those of sight and hearing. Yes, the Mystery plant has been identified as an ornamental Rhubarb (Gunnera species) from South America. Thanks for your interesting comment and for visiting my blog! Discovering nature is therapy for the heart, mind, body and spirit. I am “lifted”. Thanks for sharing the beautiful imagery and writing. Thank you for your comments and also for visiting my blog! Yes, your mystery plant is certainly a member of the family Gunneraceae, the question is which of the 40-50 varieties! They range in size and one type is enormous – hence the common name ‘Giant Rhubarb’. They are all water loving and grow well in bogs or beside ponds. They can be very invasive, and need quite a lot of space. I grew up in Zambia/South Africa and my mum always had Gunneras in her gardens, she said they were great ‘architectural’ plants. Gosh, 40-50 varieties?! That is a lot – no wonder it’s difficult to narrow down. Thanks for the additional information, and also for visiting my blog! 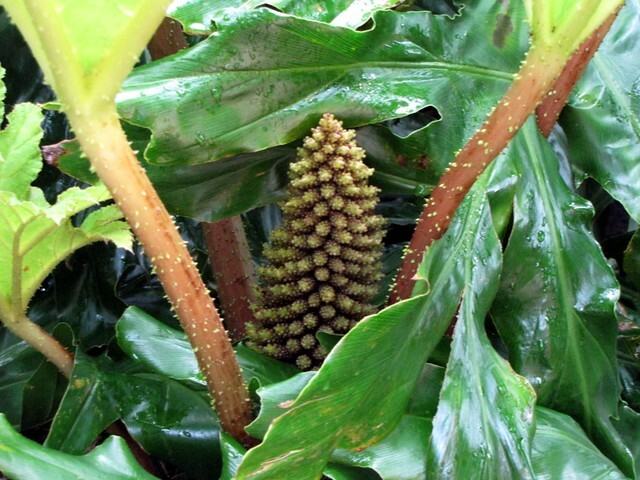 Your “Mystery Plant” is a Gunnera. Thanks, and thank you also for visiting my blog! OMG, Lisa. I haven’t read the post yet–got tired waiting for the photos to load–but will jump back to it in a second. This is fabulous! What did you do to get so much of a response? Please share the secrets! I do know the title here is FABULOUS! SOOOOO happy for you, Lisa! Sorry, no tips for you. I got Freshly Pressed on Friday. It was a total shock, but a pleasant one! Oh, I’m so stupid–you were Freshly Pressed, my friend! You soooooooo deserve this! Thrilled for you–truly! Thanks! Your encouraging comments have always meant a lot to me. I will definitely check out your blog. Thanks for your comments and for visiting my site! Our garden is not huge. The Gunnera is growing in a small flowerbed against a wall i.e. it cannot get too big. Amazing garden tour after the drought. “Delicious Monster” has to be one of the best plant names ever, I just love it! Congratulations! Thanks! “Delicious Monster” is a good name, isn’t it? And so useful for a more interesting post title. Thank you also for your kind remarks about my photos. It’s a new pursuit for me, and I’m learning so much from photographers like you. Congratulations, dear Lisa! This is a great post – lovely photos of plants that are so achingly, homesick-makingly familiar! Thanks for sharing, and I love that you love your garden so much – I’m sure it flourishes because of that! Thank you! I appreciate your support and encouragement in my blogging endeavors so much. I’ve also learnt a lot about writing from your wonderful storytelling. I think our garden is flourishing because of all the rain, and the efforts of our gardener! 🙂 Though I do love it and appreciate it daily. lovely pictures. thanks. i, too, have numbers 3 & 4 in my garden and they grow just as long as one faithfully waters them. # 4 and # 5 has been identified and thank you for the identification. if you notice when its flower starts to open, it gives off a sweet smell, i notice this in the evenings but not much during the daytime. probably because everything is still and peaceful at night. try being aware of the fragrance it emits. it brings joy to the heart. p.s. i live in the Philippines. i almost lost the plant in the last typhoon “ondoy”. the trunk broke and i tied the plant to a post then religiously watered it for three (3) months to make sure that it had a fighting chance to regain itself. my beautiful plants thrives again and the flowers keep coming. Thank you and thanks also for your very interesting reply. The Philippines must be a beautiful and green place to live. The Gunnera plant is just outside my office window, so hopefully I’ll be able to smell it when the flower opens. What a happy start to my morning in snowy Toronto to see the plants of my childhood – I grew up in Zimbabwe. I have never tried to eat the fruit of a delicious monster but a friend’s 3-year-old took a bite out of a leaf (pretending to be a lion apparently) and had to be rushed to hospital! I am glad you liked my post. It’s been so nice having ex-Africans visit my site, and let me know about it. Thanks for the interesting story (I believe that the unripe fruit are also poisonous) and for visiting my blog! Your garden is awsome, I haven’t had time to read all your responses but your mistery plant looks like ruhbarb. The stalks make devine tarts. Somebody identified the plant as some sort of ornamental rhubarb. Doesn’t sound like the edible type. I just want to point out that the plant referred to as a Delicious Monster..is in fact the Philladendron Selloam. The Delicious Monster plant bears an edible fruit. From there the name “deliciious” . The philladendron seloame only bears flowers. The “Delicious Monster” is called “Dellciosa monsterra” it is used as a pot plant..and in warmer areas it is grown outside. Hi Sarie! Thanks for your interesting comment. 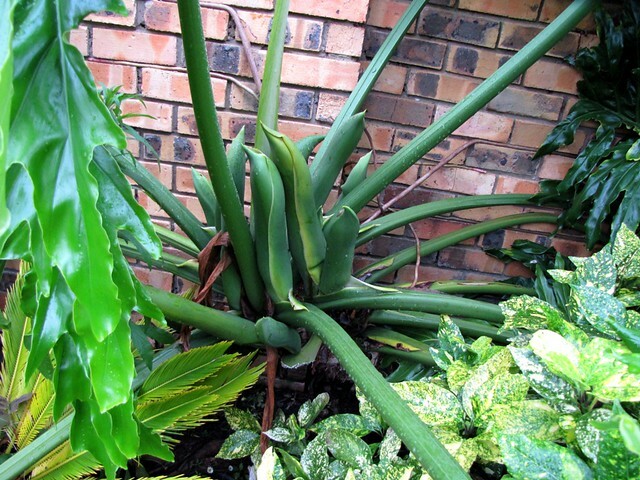 You say that the Philodendron selloum plants only bear flowers, but the plants in our garden also have fruits. Does this mean that they are Monstera deliciosa plants? I have not seen the fruit of a Selloam yet..for many years i had it in my garden. It only had flowers like the ones in your garden. I suggest that you google the name ” Monsterra Deliciosa” and compare the fruit to the fruit of your plant. I know the monsterra delciosa is edible..the fruit takes a year to ripen. There is videos of it on the Internet. Is it possible to show us the fruit of your Selloam?. It really is very interesting. I would love to see it. I wonder if it is edible too? Thanks for your reply. I can’t find any photos I took of the fruit right now, but if you look at the photos towards the bottom of this page (http://en.wikipedia.org/wiki/Monstera_deliciosa), you can see what the fruit look like. The landscape gardener who has been sorting out our garden (and is knowledge about plants) also calls them “delicious monsters”. Or maybe he just didn’t correct us! I’ve just had a look at this video http://www.youtube.com/watch?v=e7_8VQzuEpw and although the leaves are like the Philodendron, these definitely have had fruit. Could it be a hybrid? Lisa..thanks for your reply. I watched the video..and yes it clearly shows the difference between the two. I hope the viewers take note. Anyhow i think yours is very interesting..when it bears fruit again..please show us photos. For many years i lived in the Kalahari..wher summers are extremely hot..and winters very very cold. The seloame seemed to thrive in that conditions. Even after black frost. What an amazing plant to have.! This is definitely a philodendron. A poisonous plant, so not to be mistaken for the edible monstera deliciosa. It makes berries on the flower stalk and what you are refering to as fruit are just the unopened flower spathes. Please do not eat it! Dewald, I have added a note at the beginning of the post to warn readers of the mistaken identity. Dewald…thanks for the conformation of what i have said . Yes the philidendron is never the less a beautifull plant to have in the garden. It is a real show stopper. I hope it grows in the South of India too…where i will soon be living. Sarie, I have added a note at the beginning of the post to warn readers of the mistaken identity and to thank you and Dewald for letting me know about it. Interesting news about your move to India! What is taking you there?